Being a martial artist, the topic of guns comes up frequently. When it does, the issue of what caliber of ammo is best usually gets brought up along with the all-too-popular point about “stopping power”. Stopping power is often brought up by proponents of larger caliber bullets (.45 and up). The argument tends to go along the lines of claiming that the bigger bullet has a better ability to stop a bad guy that’s coming at you. Rather than conjecture about whether or not it’s a valid point, let’s use some science to figure this out. First off, let’s agree that Hollywood movies do not constitute sufficient evidence of stopping power. Ridding our minds of the images from movies that bias our thoughts on the effects that bullets have on the human body can be difficult. That’s why we have to let the science and math speak on the issue. Here the apostrophe after the velocities indicates the post-interaction velocity of the given objects. An example of this type of interaction might be a bowling ball hitting a bowling pin. Initially, the pin has zero velocity and the ball is moving at some speed. After they hit, the pin is now moving (in the direction perpendicular to the tangent of the ball at the contact point) and the ball has slowed down somewhat. If this didn’t happen, then the ball would just smash through the pin, the back wall and whatever was behind that…like the Juggernaut. 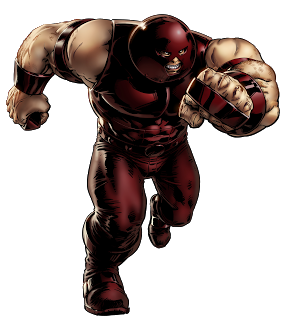 I’m the Juggernaut! Once I start moving I can’t be stopped! This is bad for science but awesome for action scenes! In much the same way, we can look at a bullet hitting a human being and what effect that might have on his momentum. In other words, we can use the above formula to calculate just how much a bullet will slow someone down. Cool, huh? Enter the bad guy. The average weight of a human male in the USA (according to wikipedia) is 195 lbs, but we’re going to say our bad guy weighs only 150 lbs (68 kg). Let’s say that the bad guy is charging at our hero. Now, this morning I ran 1.4 miles at about 3.5 m/s, which is NOT fast and certainly wouldn’t qualify as an attacking speed. So, let’s assume that our bad guy is not only small but also slow, traveling at a mere 3 m/s. v is positive, which means that the bad guy-bullet combo is still moving in the same direction as the bad guy was going before the impact. In fact, a FREAKING .50 BMG bullet that COMPLETELY LODGED into the LOW WEIGHT bad guy was only able to slow him down 2/3 of a meter per second. I won’t bore you with more math, but the results for a more realistic situation involving a .45 ACP bullet and an average weight US male traveling at a typical sprinting speed (9 m/s) would be that the bullet would only slow down the bad guy by LESS THAN 0.05 meters per second. That’s not much given most altercations happen at a distance of less than 6 feet. Even if your bullet hits a major off switch, a knife wielding bad guy might still fall on you and cut you if you don’t move out of the way. 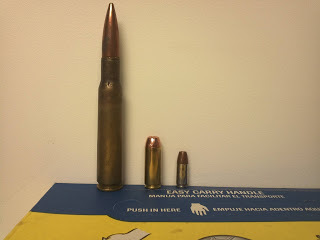 It doesn’t matter if you’re firing .22 caliber bullets or a .50 BMG. Personally, I carry a 9mm because it has MORE BULLETS. With more bullets, I can shoot more bad guys or lay down some cover fire to allow me or someone else to move. 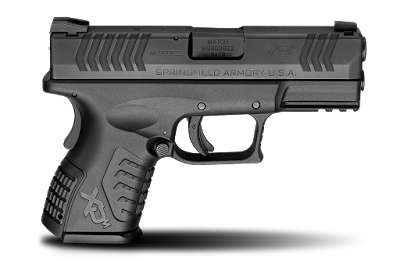 Many people will swear by their preferred caliber, and they may very well have their reasons. Just don’t let “stopping power” be one of them. 19 bullets using the full-size mag…19! !